When analyzing malware, it helps to have an isolated laboratory environment that you can infect with the malware sample to interact with it while learning about its capabilities. The lab typically involves several computer systems networked together. The computers can be physical boxes, but are often virtualized using tools such as VMware and VirtualBox for convenience and control purposes. The analyst needs to put extra care to configure the lab in a way that minimizes the risk of the malicious program escaping onto the production network. For this reason, it’s not to connect the laboratory environment to the corporate networks. Extra care needs to be exercised when virtualizing the lab, not only because of the potential vulnerability that could allow an escape from the virtualized system, but also to account for possible configuration and user errors. My earlier article described how to use VMware to build such as lab. There, I advised the use of the host-only networking option for interconnecting virtual systems using a simulated network without additional hardware. This setup works well; however, it has the weakness of allowing the physical host and virtualized systems to interact with each other through a virtual network adapter that VMware installs onto the physical host. Edit > Virtual Network Editor. Enable the “Use local DHCP service” if you’d like to use the DHCP service built into VMware. You’ll want to do this unless you have another DHCP service in the lab or plan to statically assign network configuration details to your virtualized systems. Enable “Host-only” if it’s not already selected. 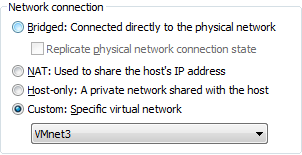 Disable “Connect a host virtual adapter to this network” if it’s not already deselected. Other virtualization software, such as VirtualBox, offers similar capabilities, though the interface will look different. If your virtualized systems are configured to use DHCP, they should get the new network settings automatically after a reboot.